CALGARY - A Canadian judicial review that could overturn the federal approval of Kinder Morgan Canada Ltd's (KML.TO) Trans Mountain pipeline expansion will begin on Monday in Vancouver. More than a dozen parties, including the company, government departments, environmental and aboriginal groups, will present their cases over two weeks before Canada's Federal Court of Appeal. A decision against the $7.4 billion expansion would send it back for assessment, a move that would cause lengthy delays. It is rare for Canada's judiciary to review pipeline approvals. The last such review, heard in 2015, led to the rejection of Enbridge Inc's Northern Gateway pipeline by the federal government. While the court has no firm deadline for rendering a judgment, it announced its decision against Northern Gateway in June 2016, about eight months after hearings ended. The Trans Mountain expansion would nearly triple the capacity of the existing pipeline from Canada's oil heartland of Alberta to the west coast of British Columbia. The two provinces joined the lawsuit this year on opposing sides. The lawsuit, brought by environmental and aboriginal groups and coastal municipalities, argues that the National Energy Board (NEB) regulator did not properly review the project, neglecting to consider several environmental issues. It also claims the federal government did not properly consult affected aboriginal groups when it assessed the project. On the other side of the lawsuit are Kinder Morgan, the federal government and the NEB. Kinder Morgan and the government did not respond to requests for comment. The regulator declined to comment. The government has called the export of its natural resources a "fundamental" responsibility, and that it has considered many factors in approving the project, including environmental concerns and views of affected aboriginal people. Kinder Morgan has said it went through extensive consultations with aboriginal groups and communities along the expansion's path and remains dedicated to engaging them. 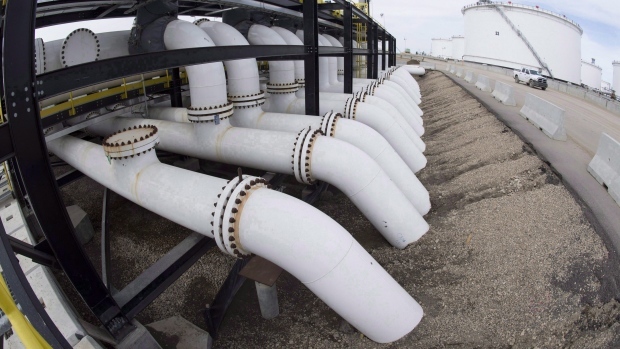 Canadian crude oil producers, who are not parties to the lawsuit, say they need projects such as the Trans Mountain expansion to fetch better prices for their landlocked product. Eugene Kung, a lawyer representing the Tsleil-Waututh Nation, a party to the lawsuit, said the results of the Enbridge case suggest Trans Mountain opponents could win the case. Regardless of its outcome, it is likely be appealed to Canada's Supreme Court, Kung said.